I'm posting this card for the Craft Barn weekly challenge (Sea) and at the same time for the Unruly Paper Arts Readers Art Quest (Nautical). I made the background using pigment powders, blue Bister and turqoise Brusho on watercolour paper. The stamp is from Rubber Dance, a sheet called Rock Carvings... this is a real image from ancient carvings in Norway. I find it amusing, that those guys don't seem to be concentrating much on sailing their ship :) The sentiment is one I found browsing the web. I mounted the panel on a copper card base (4x8), for which I happen to have petroleum blue envelopes. 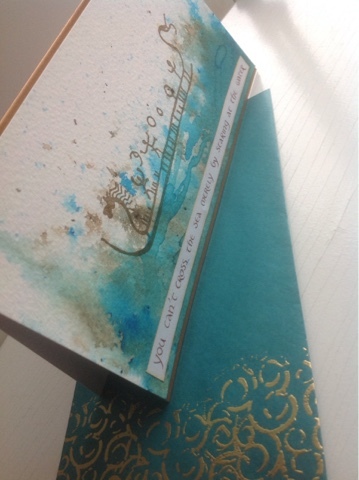 I used a swirly stamp and added heat embossing on the envelope. I've been wanting to do a page in my art journal using these elements, but time is short, so that will have to wait! A silly view, but it shows off the envelope! Love that image, beautiful Kristiina! Thank you for joining in The Craft Barn Challenge. Gorgeous!!! I love tha background you made, it's sure looks like a wild sea of waves! 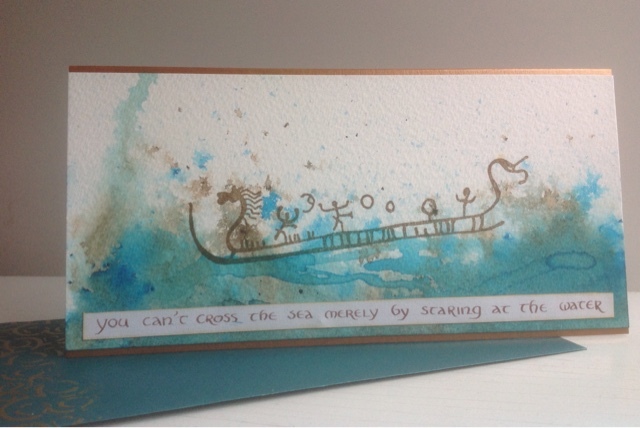 Tank you so much for making this card with my rock carving rubber stamp boat! Thanks for joining us at Unruly PaperArts! Love the background you painted. Wonderful card! !